Families often seek activity ideas for senior citizens in assisted living to keep them active and engaged. Health conditions, age-related mobility issues and a feeling of helplessness often make the elderly reluctant to leave their rooms. At The Holiday retirement communities, we have an interesting calendar of seniors’ activities to help residents live life to the fullest. Here are 10 easy senior center activities your elderly family members will enjoy. Walk or jog: Enjoy summer with a daily stroll or jog in your neighborhood or retirement community. Both activities improve muscle tone and strength as well as relieve stress. Group walks give you an opportunity to exercise and socialize in the beautiful outdoors. Even seniors in a wheelchair can benefit from being outdoors. Remember to wear a hat and take a bottle of water with you in warm weather. Go for a swim: Water aerobics and swimming are gentle on the joints and among the best ways for seniors to exercise. Check out your local community center for scheduled activities. Many offer affordably-priced programs for seniors. Have a picnic: Plan a picnic in the park or at a beach with the grandkids or friends. Bring a blanket, some sandwiches and music to lie back and relax. You can have a fun day outdoors as you soak up the sun and enjoy the fresh air. Getting vitamin D through moderate exposure to sunlight can help prevent falls, fractures and infections. Don’t forget to wear a wide brimmed hat and lather on the sunscreen to avoid overexposure. 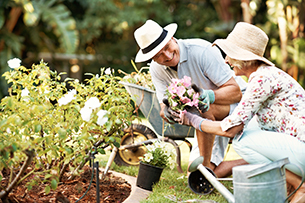 Create a garden: Gardening is one of the most fulfilling forms of physical activity and burns more calories than we realize. In addition to promoting physical and mental well-being, you can also enjoy the fruits of your labor with family and friends. Visit the local farmer’s market, fair or flea market: Summer is the season for community outdoor activities including farmer’s markets and cultural fairs. Shop around for fresh produce and exciting deals as you stretch your muscles and get some exercise. Whether you go with friends or alone, you will enjoy the shopping and benefit from the exercise and fresh air. Watch an outdoor movie: Take advantage of outdoor movies (or musical concerts) at the local park to get out of your senior apartment. Invite the family for a fun evening out or use the opportunity to make new friends from the neighborhood. Volunteer: Summer is the perfect time to get outside and engage with the community through volunteering opportunities. 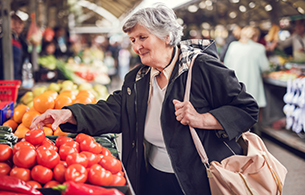 Check out the senior activity calendar in your retirement home, community center or house of worship that you can help out with. Try Tai chi or yoga: Both offer significant physical and mental health benefits for seniors. The stretching, breathing and mediation exercises improve balance and mobility (and overall health), and help to calm the mind. Pick berries: Want to try something different? Go berry picking with the young ones in the family and enjoy a tractor ride while at the farm. You will have something to bring home and can even bake a delicious pie. Move to a retirement residence: There are plenty of activities for seniors in retirement homes like The Holiday. From arts and crafts to onsite entertainment and outdoor excursions, you will enjoy an active lifestyle and the company of your peers. You can be as engaged and involved as you want while maintaining your privacy and independence. Seniors enjoy exciting, happy and fulfilled lives at The Holiday independent living community in West Hartford, Connecticut. A full range of services and well-planned daily activities cater to diverse interests and give you plenty of opportunity to socialize. Our experienced and caring team strives to make you feel totally comfortable in your new home. Give us a call at 860-233-8208 to learn more about the services and amenities we provide at our independent living facility in West Hartford, Connecticut. Fill out this online form to book a tour. What Does Aging in Place Actually Mean?